AFC Fylde have extended Jason Taylor’s contract until the end of the season. 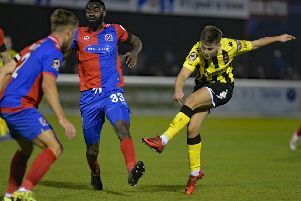 The midfielder, who turns 31 this month, joined on a three-month deal in October and has impressed Coasters boss Dave Challinor during his 12 appearances. The former Rotherham, Cheltenham and Northampton midfielder said: “I’m really pleased to be here until the end of the season. It been a very successful spell so far. I have been playing games and the team is doing very well, so overall I’m very happy. “I came out of the team a couple of weeks ago but the lads have done very well since, so I have to be patient. Hopefully I will get my chance again and then it’s up to me to nail down a place in the team.